Replay Review overturned an on-field bona fide slide rule interference call for the first time in MLB history Sunday, when Rangers Manager Jeff Banister successfully challenged 2B Umpire Gabe Morales' original call that baserunner Shin-Soo Choo interfered with the middle infielder at second base, which originally resulted in a double play and all runners returned to their original bases, but instead, was overturned to a force out and runners being allowed to advance. Choo's slide into second base, diagrammed. With one out and the bases loaded in the top of the 3rd inning of Sunday's Rangers-White Sox game, Rangers batter Elvis Andrus hit a ground ball to White Sox third baseman Matt Davidson, who threw to second baseman Yolmer Sanchez as Rangers baserunner R1 Choo slid into second base, the resulting contact between Choo and Sanchez contributing to Sanchez's inability to throw to first base. 2B Umpire Morales called Choo for a slide in contravention of Rule 6.01(j), which governs bona fide slide rule interference, resulting in Banister's challenge and overturned call following a nearly four-minute Replay Review. Related Post: Video Analysis of New Bona Fide Slide FPSR Rule 6.01(j) (3/1/16). Choo was called for tripping Sanchez. 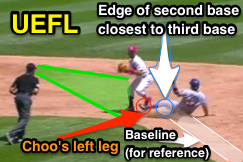 Morales ruled Choo violated provision #4 of the rule, noting that in kicking his left leg in a direction parallel to the front edge of second base (or, alternately, perpendicular to the baseline), Choo changed his path for the purpose of initiating contact with fielder Sanchez. By rule, if such a slide is not bona fide, any contact that impedes or hinders a fielder's following play is interference, and the trail runner is also out. The first time the force play bona fide slide interference rule made an appearance in the 2017 season was on April 7, when Dodgers Manager Dave Roberts filed a challenge to successfully overturn 2B Umpire Gary Cederstrom's ruling of "no interference." Cederstrom was also Morales' Crew Chief on Sunday. BRD: Had Choo's slide occurred at any level governed by NCAA or NFHS rules (college or high school, e.g. ), Choo's slide would have been illegal and resulted in a double play for violation of the NCAA or NFHS force-play-slide rule. Both codes have identical language in this regard: "A slide is illegal if—the runner slashes or kicks the fielder with either leg." Choo would also have been declared out for interference via an illegal slide under the NCAA/NFHS rules because he failed to "slide in a direct line between the bases." 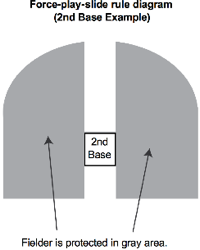 As indicated in the first diagram, Choo's leg veered to the left of the edge of second base, which fails to satisfy the "direct line" criterion. In reference to the NCAA's FPSR diagram, Choo's slide took him into the gray area; if there is contact between the fielder and runner in the gray area, the fielder is protected and the runner may be called for a violation of college baseball's force-play-slide-rule. Dead ball, double play, return all runners to their original bases. Related Post: NCAA CWS - Force Play Slide Rule Negates LSU Run (6/27/17).